When presenting a live webinar, you’ll notice that about 30% of registrants will actually attend, leaving 70% of people needing to be given other opportunities to buy. Therefore, your responsibility as a marketer is to create marketing material in order to turn the people who attended and didn’t buy and the people who didn’t attend, into buyers. In order to do so, you’ll need to segment your list. In other words, create campaigns within your autoresponder system (such as aweber, getresponse and infusionsoft) in order to market accordingly. But first, you’ll need to figure out who attended and who didn’t. Live webinar systems such as Gotowebinar allow you to download these lists, by going to “generate reports” and then selecting “attendee report”. Gotowebinar will then create a spreadsheet listing all attendees with a column next to their name, stating whether they attended or not. You can then remove the people who became customers and then upload the list of people who attended and didn’t buy and upload the list of people who didn’t attend into 2 different campaigns in your autoresponder system. Infusionsoft works slightly differently from other systems, and allows you “tag” people according to their actions. For example, you can create a tag called “attended webinar on march 17 and didn’t buy” and attach that tag to the people who match that description. By doing so, it allows you to send emails to specific people who have certain tags. Then, you’ll need to create email sequences for both these groups of people. To write to attendees who didn’t buy, your emails need to answer their potential sales objections and add value in order to not be considered as a pest. What an exciting webinar we had yesterday, over 200 people joined the live call! I hope you learned some things you can implement straight away. By the way, straight after the webinar a few people were asking for a payment plan for the offer we made to suit their budget, so if you’d like to know more, just hit reply to this email. To write to people who didn’t attend, the best option is to send them the replay. However, most people don’t end up watching the replay as they “leave it to later” and then get distracted or completely forget about it. This is why, when sending follow-up emails with the replay, it’s important to add an element of scarcity such as “the replay is only available for 24 hours”. If you do add an element of scarcity, make sure you honour your word. If you don’t, and the replay is still available after the timeframe you specified, you will lose all your credibility for this campaign and future ones too. You’ll have to be quick though, as the replay will only be available for the next 24 hours. Hopefully, you see this message on time! During the webinar I also gave complimentary access to my proven sales templates, valued at $497. It’s everything I’ve ever used to generate sales, and when you watch the webinar, you’ll be able to download them, copy and paste them over and over again. Oh, and they work in any market! 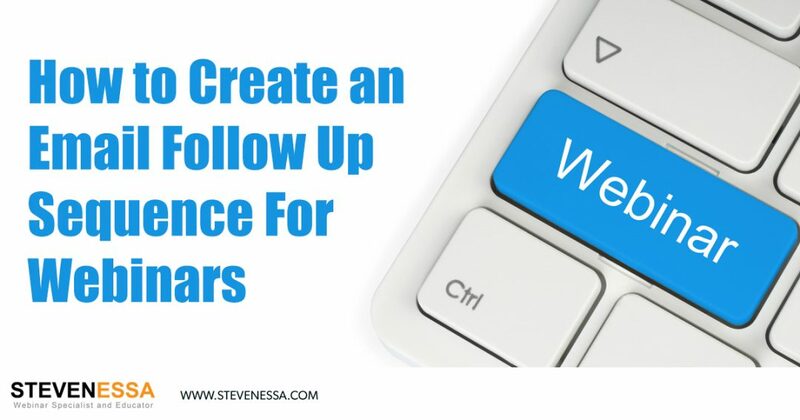 Most people stop with one follow-up email, so if you want to get better results than most people do, follow up on your follow-ups. By simply adding value to each email follow-up you send, justifies your reason for emailing prospects, nurtures your list and of course, will allow you to pick up sales you wouldn’t be picking up otherwise. The best sales people and the best marketers are the ones who persist, and only stop when prospects clearly state they’re not interested. Once you have written your follow up emails for both groups of people and scheduled them to be sent daily for the next 5-6 days, it’s time to put together a “nurture campaign”. A nurture campaign is simply the process of emailing people who haven’t bought regardless of your follow-ups but who haven’t unsubscribed. In other words, people who weren’t interested in your webinar or webinar offer but still want to hear from you. Emails in a “nurture campaign” are simply used to stay in touch with your contacts, build the relationship and trust further with them so they remain responsive to future offers you make. You see, most sales people don’t know how to turn objections into sales opportunities. Well, in this complimentary training, I show you how to turn any objection (no matter how tricky) into sales.